Turtle and Rat for solo pipa (2012) 5'30"
vertigo for solo violin (2009) 4'45"
Three Sketches for solo piano (2003) 4'30"
restrictions apply, see details for violin and clarinet (2007) 1'30"
Six Sketches for violin and piano (2003) 11'43"
Roaring Fork for mixed sextet (2009) 5'30"
Gestations for electronic playback (2001) 4'13"
Five Parametric Etudes for Disklavier (1996-8) 9'30"
for solo pipa (2012) 5'30"
Turtle and Rat is a two movement set for solo pipa which were inspired by the two eponymous animals. The Turtle is depicted by characteristicly slow and bumbling music. Each refrain is a little different, developing the music by adding increasing pipa techniques to color the melody. The Rat is more wily, being depicted by pitch bends and other ornaments. The form is a modified palendrome (the second half of the form is really the first part in reverse)--the music is circular and returns to the beginning in the way that a rat returns to the hole after scampering about. These two movements were written for pipa virtuoso Yang Jing, who premiered them at the University of Hawaii at Manoa in 2012.
for solo violin (2009) 4'45"
vertigo uses scordatura (retuning) to achieve special "dizzying" texture. The constant alternation between the harmonics and conventional passages attempt to illustrate the sensation of vertigo: fear, disorientation and the momentary loss of balance. Andie Springer premiered vertigo with the ensemble Redshift in 2010. 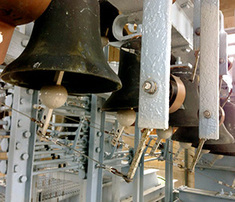 Three Pieces for Carillon was written for Richard Giszczak, a carilloner and chemistry professor at the University of Michigan. The first movement "Kulintang," evokes Filipino kulintang gongs (see my other kulintang pieces), the second movement "Hymn to Claude Vivier," uses melodic devices inspired by Vivier, and the last movement "Resonant Bodies" creates a stream of continuously modulating, whirling sound. Giszczak premiered the pieces at UM in 2007. A Play of Intentions is a short fantasy for harp which plays with the idea of recurring expectations. It was written for Julie Barnes, who premiered it in October of 2003 at Rochester Contemporary in Rochester, NY. for solo piano (2003) 4'30"
The Three Sketches develop two basic pianistic gestures, the chord and the arpeggiation. The first sketch takes the phrase and fixed-pitch stucture of Filipino kulintang music and superimposes it onto a chromatically shifting chordal accompaniment. The overtone series figures prominantly in the last two sketches as a harmonic device. The Three Sketches were written for Ralph van Raat in 2003. Contact me for a perusal score. The Angry Birds of Kauai was inspired by the multitudes of birds that squawk and sing in cacophony every morning on the Hawaiian island of Kauai. The melodies and gestures imitate the rapid birdsong banter that they accomplish when they call, respond and furiously compete for mates. Though the birds may or may not be angry, I definitely was after being woken up in the country every morning at the crack of dawn. This work was created specifically for Hilary Hahn's 'In 27 Pieces: the Hilary Hahn Encores' online contest. It was subsequently awarded the Grand Prize and was performed and recorded by Hilary Hahn in 2013. ​Her ‘encores’ album won a Grammy in 2015. 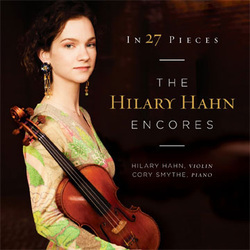 ​BUY THE HILARY HAHN ENCORES SCORE EDITION! TAG was written for the New York Miniaturist Ensemble. It uses scordatura harmonics on the 2nd violin part and a CD recording of an electronic drone. The name refers to a type of graffiti which is consists of a short, single word that is quickly written in a single gesture. This short piece for violin duo was written quickly, and may be heard as a protracted, single gesture. Christopher Otto and Erik Carlson premiered TAG at the Tank in NYC in 2010. 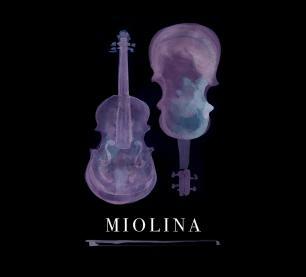 Miolina features TAG on their new album on the Composers Concordance label. for violin and clarinet (2007) 1'30"
restrictions apply, see details was written for the New York Miniaturist Ensemble. It uses scordatura harmonics on the violin part so that all microtonal notes are precise and consistent. The clarinet has some microtonal multiphonics as well. It was premiered at the Stone in NYC on October 12, 2007 by Erik Carlson (vn) and Joshua Rubin (cl). for violin and piano (2003) 11'43"
The Six Sketches, arranged for violin and piano are a set of contrasting, short movements which explore the dynamic between violin and piano. Each movement has different mode of operation: the first gradually shifts rhythmically and registrally, the second is a dramatic narrative, the third shifts coloristically and rhythmically, the fourth is another dramatic piece, the fifth shifts metrically and the last movement has an gradually changing ostinato-like rhythm which is occasionally interrupted an arpeggiated gesture. 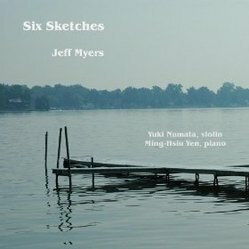 The Six Sketches were premiered by violinist Yuki Numata and pianist Ming-Hsiu Yen at the Midwest Composers' Symposium at the University of Michigan in October of 2004. Metamorphosis is a dramatic violin concerto which juxtaposes and recombines three contrasting sound-worlds which synthesize and transform themselves throughout the musical narrative. Metamorphosis was premiered by violinist Yuki Numata under conductor David Gilbert with the Eastman Philharmonia at Eastman Theatre in May of 2002. This piano reduction was premiered at Symphony Space in 2007. The version with strings and piano was premiered by Yuki in 2009 at Le Poisson Rouge with Ryan McAdams and the Wordless Music Orchestra. for 2 violins and piano (2018) 5'30"
Death is my shadow. was written for Eric Nilsson's Fiddler X private concert series in St. Paul Minnesota. 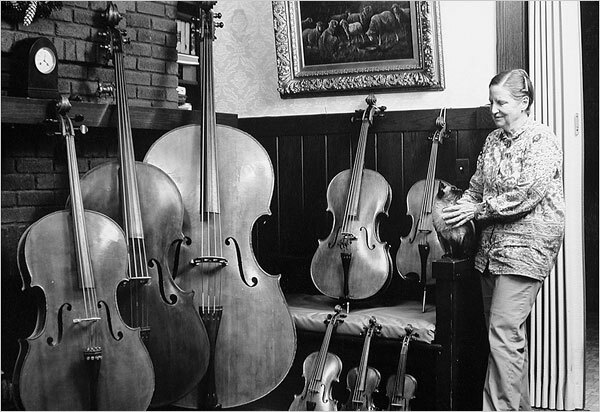 Eric, the brother-in-law of Garrison Keillor, is a lawyer by trade, but like his sisters, plays a string instrument. His annual concerts are filled with fun presentations around a certain theme. The 2019 theme was J.S.Bach. The commission stipulated that the piece had to reference the Bach D minor double concerto (second movement) and another influence, such as music from Asia. This led me to kulintang and gamelan music. Were Bach to visit Indonesia and Mindanao, he might have enjoyed the intricate interweaving of melodies in the gamelan orchestra (which pre-dates Bach's own music by about five centuries). He may have also enjoyed the rapid toccata-like music of the Kulintang gongs. In this piece, I wanted to make a gradual metamorphosis from Bach into the gamelan and kulintang world. The music starts out slow and relaxed, with Bach-esque counterpoint, then begins to accelerate once the Asian music enters the fray, leading to a giant climax of synthetic gongs and rapidly arpeggiating violin music (the kulintang influence). The title relates to the idea that you must not dwell on the past: live as if today might be your last. In a sense, the music does the same thing, taking us from the past into a new future full of exciting possibilities. Death is my shadow. was premiered by Eric Nilsson, Lydia Lui and Sally Scogin at Garrison Keillor's St. Paul residence on January 19th, 2019.
binalig was written for Timetable Percussion in 2011. It is scored for small gongs (or any similar graduated percussion with a definite pitch), any kind of drum, and drum set with an agung, or any large gong. The variable instrumentation allows the players to color the piece the way that they like, or to play the instrument that they would prefer to play. The ensemble vaguely resembles a Filipino kulintang ensemble, which usually features a soloistic gong set, a continuous drum beat, and a set of large gongs which play a bass pattern. The form of the piece is also similar to kulintang music, in that it uses short cyclical melodic motives. In my piece, these patterns develop and morph in different directions than conventional kulintang pieces, but nonetheless, the ethos of kulintang pervades the music throughout. In the kulintang repertoire, the "binalig" genre represents a modern or progressive approach to the performance and compositon of kulintang music. LISTEN to audio samples on Amazon.com! The Kulintang Suite for violin, piano and assistant is a set of pieces based on and inspired by kulintang gong melodies. All but the first melody are based on real kulintang pieces. Many of the original melodies are distorted, contracted and re-pitched for expressive reasons. In movements II, IV and VI, the assistant mutes and or stops the piano strings, turning the piano into a gong-like percussion instrument. The Kulintang Suite was commissioned and premiered by Yuki Numata, with composer Ming-Hsiu Yen on piano along with myself as the assistant at Ms.Numata's Master's Degree Recital at the University of Michigan in March of 2006. Elegy was not written as a reaction to any specific event, but is pervaded nevertheless by an air of somberness and ritual. It was written while in residence at the CSU Summer Arts Festival in Fresno, CA where it was premiered by violinist Hebe De Champeaux, pianist Jennifer Maybee and percussionist Matthew McClimon in July of 2000.
for string quartet (2005/2018) 10"
short quartets (Movement 1) was written especially for the St.Petersburg Quartet readings while they were in residence at the University of Michigan in 2005. The latter movements were written thirteen years later as an expansion to the original stand-alone movement for Quartet Metadata. Movement 2 is a take on jazz, with a walking bass parody. Movement 3 is dedicated to Matt Marks, who will be remembered for his dedication to new music and his fearless, singular musical expression. Movement 4 is a picture of the frenzy of stock trading right at the opening of the markets. It begins with much excitement and volatility and usually ends with sadness, regret and boredom. 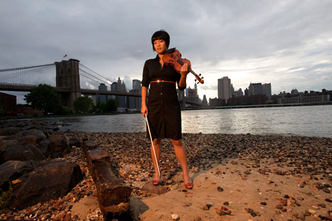 Prelude and Mutation was written for The Links at the behest of violinist Yuki Numata Resnick in 2012. The Prelude serves as a metaphor for a great world tradition: the musical style was inspired by the violin music of South India; after it is over, we enter the mutation phase, which gradually adds layers of harmony-color, interruptions, fragmentation, and rhythmic counterpoint (provided by the tabla-like percussion). The mutation is a metaphor for the modern condition and corruption of a longstanding tradition. The constant drone imitates the sound of a shruti box, tambura, or other Indian-like drone device or instrumental color. The premiere took place at the Stone NYC in 2013.
dopamine was written for the JACK Quartet. It uses scordatura (retuning) and natural harmonics on the all the instruments to obtain precise microtonal notes and chords. The title refers to a hormone and neurotransmitter which occurs in humans and some mammals. Dopamine is typically associated with the pleasure system; people with higher dopamine levels tend to seek out more pleasurable activities and vice versa. Dopamine is also associated with creativity and the generation of new ideas. I used dopamine as a metaphor for this string quartet because it was written within a short span of a few days in an unprecedented creative fervor. My motivation came from both the creative experience and from the music itself, which gave me great pleasure to listen to. Perhaps my own level of dopamine was very high as I wrote this music. I suppose I will never know. Tidtu [TEED-too] is a style of Philippine kulintang music, a genre which is played by an ensemble of gongs and a drum. My piece takes a tidtu melody and gradually transforms it into a swirling harmonic texture. Tidtu was commissioned by the PRISM Quartet and premiered in New York City at Symphony Space in May of 2005. Metamorphosis II, a string quartet in one movement, is a tour-de force, traversing quiet sonorities, amorphous textures, driving rhythms, and lyrical outpourings. Most of the musical motives and melodies are remotely derived from the R&B tune California Soul. Although this tune is never heard, elements of it pervade the piece is various guises. Metamorphosis II was written on a commissioning grant from the Fromm Foundation and premiered at the Eastman School of Music by Christopher Otto, Yuki Numata, Kirsten Swanson, and Kevin McFarland in February of 2003. The third movement has a lyrical hymn-like melody which I imagine is some kind of special prayer for the sacrifice. In the final bars, the drums and blaring chords return, as the cello crescendos to a fever-pitch as a sacrifice is made for the gods. Wizard Island was written on commission from Music in the American Wild, an ensemble formed to tour United States National Parks for the centenary celebration. It was premiered in Mammoth Cave National Park and toured across the country in the summer of 2016. Email contact@jeffmyersmusic.com for MIDI or a set of digital parts! The Four Little Sketches were written during my residency at the Bloomingdale School of Music as part of my residency with Con Edison's Exploring the Metropolis program. It was commissioned by the Bloomingdale School of Music. ​ The first movement, The Neighbors, is literally taken from the experience of composing this music in my apartment while banging noises and music filtered through the walls, constantly interrupting me. (This is a typical New York problem, so I'm sure most people can relate!) The second movement, Currents, is a metaphor for a kind of flowing, as in a river or electrical current. The third movement is untitled a study in harmony and color, this movement explores a particular chord based upon the overtone series (the collection of frequencies present in most tones, including these string instruments). The final movement, Alarm, relates to the first and second movements, but is much more aggressive in nature, representing another phenomenon which we all know: car alarms which blare out of nowhere, briefly interrupting the serenity of my New York day. The piece was premiered at Carnegie Hall in 2013 by A4TY. for sextet [bcl,hn,perc,hp,vc,cb] (2009) 5'30"
Roaring Fork was written for a special Exchange concert presented by the New World Symphony. In anticipation of a weekend of concerts devoted to Charles Ives, New World commissioned four composers: David T. Little, Timothy Andres, Daniel Manoiu and myself, to write works that somehow tied into Charles Ives' music. My piece, Roaring Fork, is based on Ives' The Housatonic at Stockbridge (from his Three Places in New England) in combination with my own experiences with the Roaring Fork river in the Colorado Rockies. My piece evokes a topographical journel along the river, capturing its essential features in music. Using bass instruments, folk melodies and special techniques, I make a musical-historic recreation of experiences from melting snow, to whitewater rapids, to the confluence with the Colorado River. This commission was made possible by the American Composers Forum with funds from the Jerome Foundation. Email contact@jeffmyersmusic.com to obtain score and parts! A stay in Bali in 1976 marked a turning point in Claude Vivier's career. Most of the subsequent works were to show the influence of the atmosphere of this Pacific island, whose inhabitants call it the "Island of the Gods," or Pulau Dewata. Vivier said of this piece, "I wanted to write...a piece imbued with the spirit of Bali: its dances, its rhythms and, above all, an explosion of life, simple and candid." The original score does not indicate any instrumentation, rather, it is left to the performers to decide. This orchestration draws on the sounds of the Indonesian Gamelan, using a small percussion orchestra, including gongs, mallets and drums, to signify the Balinesian spirit to which Vivier alluded. It was commissioned by Jeffrey Milarsky for the Manhattan School of Music Percussion Ensemble in 2009. In memory of Allen Strange was written for the Aspen Contemporary Ensemble. These two movements are dedicated to my former teacher Allen Strange (b.1943 d.2008). His passing made me reflect upon various memories of him at San José State University where I worked with him as a student in 1997. Allen once claimed that all of his pieces had the tune "Over The Rainbow" hidden somewhere in them--this was a kind of game for him. Much of the material for my piece was generated out of this melody: almost all of the string material and much of the percussion and other parts are permeated with its contours. Makassar Strait was written for Transit, a New York-based group which is dedicated to performing music from all home and abroad. Makassar Strait is a body of water which connects the island of Mindanao, Philippines with the Indonesian Island of Java. Three of the four movements make use of Filipino kulintang (gong percussion) melodies woven into the fabric of the music. The third movement represents an excursion to Java via Makassar Strait. Hints of Javanese Gamelan color the tone of this movement. The final movement plays with Escher-inspired musical textures and counterpoint. While writing this piece, I had the sound of my son's toy emergency vehicles in my mind. His latest fascination with firetrucks, ambulances and videos of tornadoes, hurricanes, volcanoes, tsumanis, floods and other natural disasters was also constantly present. I found it almost impossible to write anything other than a reflection of this environment. Sirens, horns, beeping sounds, wind, rain and chaos fed my musical ideas as I wrote. It only seemed natural to make a piece of music about an impending disaster, or at least some kind of panic inducing threat. 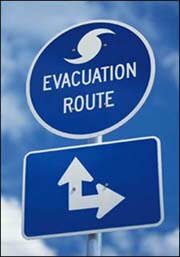 In my mind I hear a commotion of people trying to evacuate a disaster zone, with sirens, alarms, traffic and sounds of chaos. Then there is calm before the event while the last few people either flee or hunker down. The event happens and it is glorious: overwhelming in its magnitude, I can only imagine a sense of awe from those in the distance and the heroic dispositon of those willing to stay behind. Escape was written for Maestro Andrew Kurtz and the Gulf Coast Symphony in 2016 on commission and was premiered December 3rd of 2016. Liberation was written for the Ann Arbor Symphony at the request of its conductor Arie Lipsky. This piece is a musical interpretation of M.C. 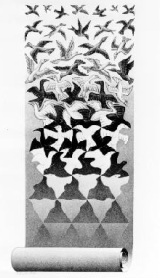 Escher's lithograph Liberation, in which geometric shapes morph into birds. In my musical version, pulsating chords morph into bird song. For more on Escher, visit www.mcescher.com. For a link to the Liberation lithograph click here. OTHER VERSIONS: The score is also made available without the last movement, for programming options. Organum-Tambura was written for the University of Michigan Symphonic Band. This piece is all about blurring the distictions between color, harmony and melody. Both organum (the practice of singing a parallel melody an interval above or below another given melody) and the tambura (Indian drone instrument) are evoked in this piece because these musical topics resonate with the idea that harmony, color and melody are on a continuum. The use of propulsive rhythms and overtone chords was in some ways influenced by many listenings of Georg Friedrich Haas's orchestra work natures mortes. after Escher for orchestra was written for Festival Acanthes and premiered by Jacques Mercier with the Orchestre National de Lorraine in 2006. The music is made of melodies and textures which, in different ways, do something illusive in the spirit of M.C.Escher. There are melodies which interlock in grid-like fashion, melodies which become stretched, chord progressions which keep ascending without getting higher, and colors which fade in and out. Some of these gradual changes span a few bars and other span the whole piece (such as the gradual introduction of more and more dissonance). Regeneration is a four movement orchestral work which contrasts stark action with meditative, sensuous tableaux. The last movement quotes fragments of the first three movements; these fragments regenerate and then transform into the violent music from the beginning of the last movement. 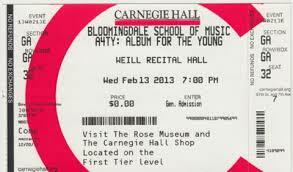 Regeneration was commissioned by the New York Youth Symphony and premiered under Paul Haas at Carnegie Hall in May of 2004. Read the full program notes here. Metamorphosis is a dramatic violin concerto which juxtaposes and recombines three contrasting sound-worlds which synthesize and transform themselves throughout the musical narrative. Metamorphosis was premiered by violinist Yuki Numata under conductor David Gilbert with the Eastman Philharmonia at Eastman Theatre in May of 2002. The reduction for violin and piano was premiered at Symphony Space in 2007 by Yuki Numata and Ming-Hsiu Yen. 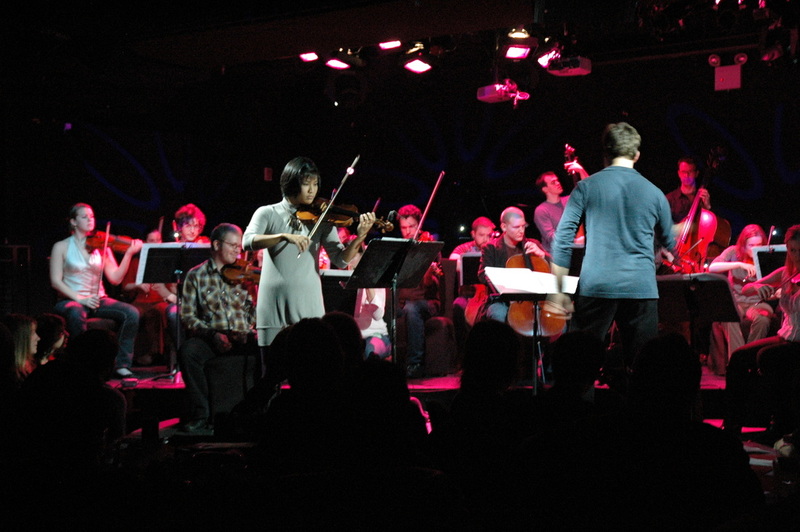 The version for violin, string orchestra and piano was premiered at Le Poisson Rouge by the Wordless Music Orchestra under Ryan McAdams in 2008, again with Ms. Numata as the soloist. Metamorphosis has garnered awards from BMI, The Eastman School, Society of Composers, and the American Academy of Arts and Letters. arr. [Schoenberg/Myers] for orchestra (1998) 5'30"
This orchestration of Arnold Schoenberg's Sechs Kleine Klavierstucke (Six Little Piano Pieces) was made for the San José State University Symphony. They performed it under Jun Nakabayashi on May of 1999. This piece is bad: out-of-tune and sloppy like a bad horn recital. It's basically a notated butchering of a mediocre composition (like a field transcription of Western concert music). Usually I try to write the best music I can, but this time I wanted to do the polar opposite and write something that sounds so bad that it's good. As a musical comedy, I think it is really funny. I notated out-of-tune mistakes with correct valve keys. Ironically it is pretty hard to play this piece perfectly as notated, even though no one would know the difference. As a result it is actually hard to play and will probably result in making honest mistakes on top of the layer of intentionally notated mistakes, so the player will still feel the stress that a younger inexperienced, and unpracticed player would feel while playing a conventional piece. On top of this, I call it Graduation March as a comment on the fact that many young students are pushed along in our schools without actually achieving success; teachers would rather just give them a pass to push them along, even if they will most likely fail in the outside world. The MIDI version adds another layer of cringe-worthiness, with the robotic execution and stale tones of the basic midi sounds on top of the bad music. 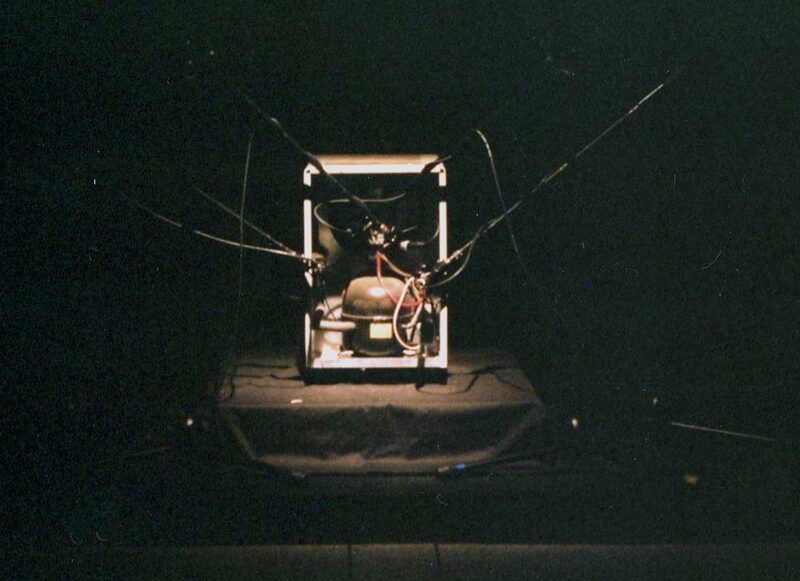 Buzz is a sound installation which presents the common ambience of buzzing appliances as a concert/art event. Various "instruments" such as refrigerators, dehumidifiers, and electric typewriters are plugged in and run with amplification for about six hours a day. They sit spotlighted on a stage and are presented before the audience (anyone who happens to drop by) who may sit in the dark on chairs or benches and read the program while sucking on a Halls® (to prevent noisy coughing). Buzz has shown at the University of Michigan and the Muziekgebouw in Amsterdam. for electronic playback (2001) 4'13"
Gestations abstracts the essence of speech and creates a colorful, textured narrative. It begins with an electronically stretched-out scream, followed by a layering of spoken dialogue (using readings from a computer program manual), and ends with a static harmony that fluctuates with the quality of human speech. Gestations was written in 2001 using the programs Cecilia and Ceres3. The Five Parametric Etudes were written and conceived for the Disklavier, a computer-driven player-piano. Each etude takes advantage of the possibilities inherent in a piano which has the ability to play music which would be impossible for human pianists to master. Disklavier music can be loaded onto a floppy disk and played back live to hear; click on the link below to download the files. The Five Parametric Etudes has been played several times and was premiered in its entirety at the Walker Art Center as part of the Sonic Circuits VI Festival in November of 1998.